For many of us, coffee is a lifestyle. With our love for coffee, we pay close attention to many details: the coffee machine, a mug, and, especially, the coffee freshness. Every morning starts with coffee, and it can guarantee a great day if made well. Since you crave for a fresh and tasty cup of coffee every morning, you’ve decided to start drinking it at home. In fact, 70% of U.S. coffee lovers consume their favorite beverage at home. And if you spend big bucks on buying good coffee, you also need to know how to store coffee beans to maximize freshness and aroma. So, do you want to learn actionable tips on storing coffee beans? You’ve come to the right place. Keep on reading to find out everything you should know about storing coffee beans at home. To savor good coffee at home, you need to know many things – what coffee company is the best one, what beans to choose, and how to store coffee beans. However, there’s another important thing you need to know about coffee beans: do coffee beans expire? Buying coffee beans at a local coffee store, chances are that you notice a roast date labeled on the bag. To roast coffee beans at home, you must know whether coffee can expire or not. Here comes the ugly truth: as a volatile substance, coffee changes. On average, coffee beans can be considered fresh within about two weeks after roasting. Obviously, while it’s easy to tell whether milk has gone or not, it may be more difficult to determine whether coffee beans are fresh or not. However, coffee is fine until it tastes good. Freshness depends on the type of coffee. When coffee is ground, it has room for oxygen that let flavor compounds flush away faster. To keep coffee fresh, you’d better leave the beans whole. The coffee freshness also depends on the packaging. If you want to know how to keep coffee beans fresh, you need to understand what the right conditions for storing are. If not stored properly, coffee can go bad. Want to know the best way to store coffee beans? 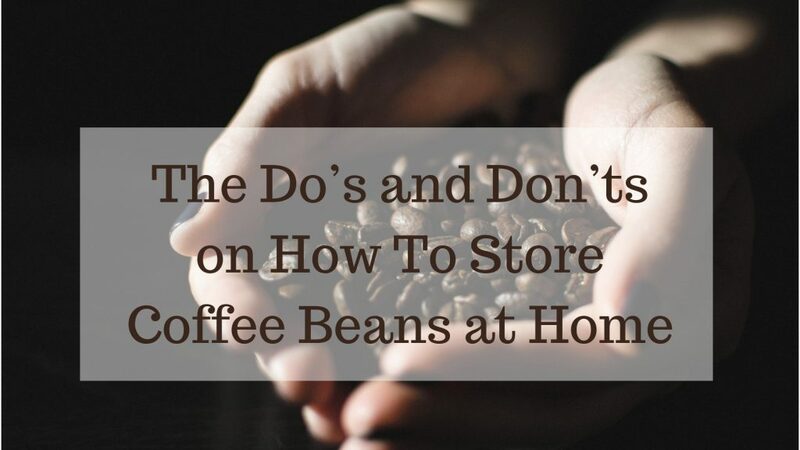 Pay attention to the list of do’s and don’ts on storing coffee beans. Use the whole coffee beans. It goes without saying that it’s better to use freshly-roasted beans fast. If you have much coffee and it’s important to keep it fresh, you’d better avoid storing ground coffee. When you grind coffee, it gets a much spare area for oxygen, so it goes bad faster. Thus, it’s better to use the whole coffee beans as they keep the flavor and last longer. Choose an airtight vacuum sealed bag. To make a good cup of coffee, your beans should be fresh, so it’s important to find an airtight bag that doesn’t let air, light, and heat destroy coffee beans. When you choose an airtight vacuum sealed bag, you keep coffee beans cool and out of direct sunlight. As a result, they stay fresh longer. Invest in specialized containers. When it comes to choosing the container for storing coffee beans, its characteristics play a key role: a perfect bag should have barriers against oxygen and the escape of aroma. For example, it’s not a good idea to store coffee beans in a paper bag as this material promotes staleness. Even if you have some bags for storing coffee beans, you need to ensure they won’t let the air, light, or heat come in. Thus, it’s better to get a specialized container for storing coffee. Freeze coffee beans. It’s a well-known fact that storing coffee in a cool place is a good idea. However, many people argue about keeping coffee beans in a freezer. While the National Coffee Association doesn’t recommend to freeze coffee beans for a short period, it’s a good idea to use the freezer if you want to store roasted beans for a long period. Plus, you need to know the right way to freeze coffee beans if you don’t want to destroy the taste and aroma of coffee. Put coffee beans close to direct sunlight. 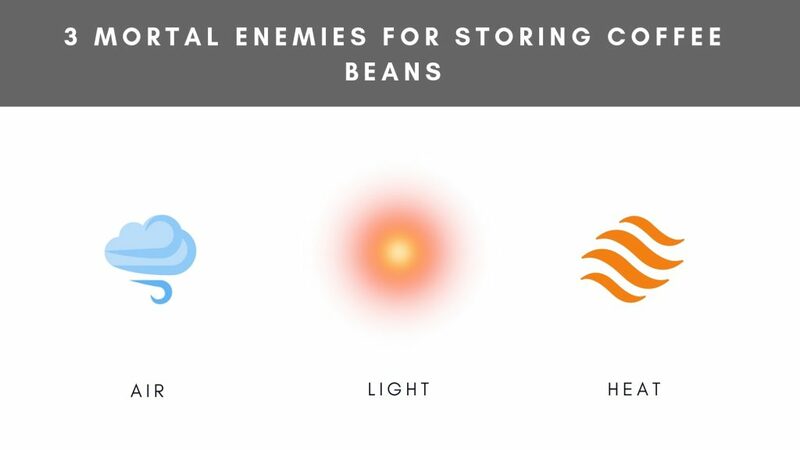 To ensure your coffee can last long, you need to know top enemies for storing coffee: air, light, and heat. When looking for a perfect place for storing coffee, you need to avoid heat and sunlight, so you’d better find a dark and airtight space. Keep coffee on countertops or near stoves/ovens. After roasting coffee, you want it to cool down before storing. Thus, you can leave it on countertops without realizing the fact that it can affect the freshness of the coffee. In fact, these places are too warm, so coffee can’t stay good and tasty for a long period. Use a loosely closed bag. When you take coffee for brewing it, you can forget to close it well with time. Although you may not pay attention to it, you let air sneak in and destroy your coffee beans without realizing it. Thus, it’s important to avoid using a loosely closed bag. Refrigerate. Although some people believe that freezing coffee beans can be a good idea and other people don’t share this opinion, everyone would agree that putting coffee in a freezer after defrosting leads to coffee destruction. Since fridges have a lot of moisture, coffee absorbs odors and tastes, and therefore, it loses its qualities, especially when refrigerated. While the above-mentioned tips can help you keep coffee fresh for a longer period, you need to know some extra tricks if you choose ground coffee instead of the whole coffee beans. Unfortunately, ground coffee goes bad faster. Thus, you need to be picky about choosing the right equipment and place for storing it. When coffee is ground, it starts deteriorating fast when exposed to air. 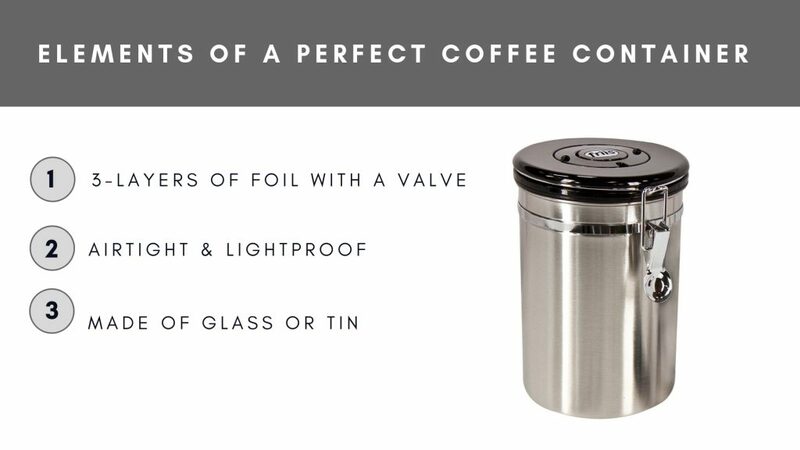 So, it’s better to get a professional airtight container that doesn’t allow air, light, and heat to affect the quality of coffee. All in all, if you want to brew ground coffee, remember that you need to use it within two weeks of roasting while coffee beans can stay fresh for a month. No matter what coffee you have, whether the whole coffee beans or ground coffee, you need to have a good box for storing it. Thinking about coffee bean storage, you need to choose a good container that doesn’t let air, heat, and light come in. Even if you don’t have much money to get a professional bag for storing coffee, you need to know what makes this bag good. To begin with, take a look at our handy visual. You’re welcome to share it on social media in order not to miss. Once you’ve found the right container, you can ensure your coffee beans stay fresh as long as you need it. As a result, you can enjoy tasty coffee at home. Roasted coffee starts losing its qualities right after the process of roasting. If you want to enjoy fresh coffee, it’s important to use coffee beans as fast as you can. If you don’t drink much coffee and you want to how to store coffee beans at home, you need to remember three main things to avoid: air, light, and heat. Plus, don’t forget to ask professional baristas for handy tips and tricks. Once you find some secrets on storing coffee at home, don’t be greedy to share them with us! We’re waiting for your thoughts in the comments below.